In general, a self-directed IRA LLC may be funded by a transfer from another IRA account or through a rollover from an eligible defined contribution plans, defined benefit plans eligible defined contribution plans include qualified 401(k) retirement plans under Internal Revenue Code Section 401(a), 403(a), 403(b), and governmental 457(b) plans. What is the most Common Way to Fund a Self-Directed IRA? Transfers and rollovers are types of transactions that allow movements of assets between like IRAs – Traditional IRA to Traditional IRA and Roth IRA to Roth IRA. An IRA transfer is the most common method of funding a Self-Directed IRA LLC or Self-Directed Roth IRA. An IRA-to-IRA transfer is one of the most common methods of moving assets from one IRA to another. A transfer usually occurs between two separate financial organizations, but a transfer may also occur between IRAs held at the same organization. If an IRA transfer is handled correctly the transfer is neither taxable nor reportable to the IRS. With an IRA transfer, the IRA holder directs the transfer, but does not actually receive the IRA assets. Instead, the transaction in completed by the distributing and receiving financial institutions. In sum, in order for the IRA transfer to be tax-free and penalty-free, the IRA holder must not receive the IRA funds in a transfer. Rather, the check must be made payable to the new IRA custodian. Also, there is no reporting or withholding to the IRS on an IRA transfer. How the Self-Directed IRA Transfer Works? Your assigned retirement tax professional will work with you to establish a new Self-Directed IRA account at a new FDIC and IRS approved IRA custodian. The new custodian will then, with your consent, request the transfer of IRA assets from your existing IRA custodian in a tax-free and penalty-free IRA transfer. Once the IRA funds are either transferred by wire or check tax-free to the new IRA custodian, the new custodian will be able to invest the IRA assets into the new IRA LLC “checkbook control” structure. Once the funds have been transferred to the new IRA LLC, you, as manager of the IRA LLC, you would have “checkbook control” over your retirement funds so you can make traditional as well as non-traditional investments tax-free and penalty-free. The 2001 Economic Growth and Tax Relief Reconciliation Act expanded the rollover opportunities between employer-sponsored retirement plans, such as 401(k) Plans and IRAs. Since 2002, individuals may rollover both pre-tax and after-tax 401(k) Plan fund assets from a 401(a), 403(a), 403(b), and governmental 457(b) plans into a Traditional IRA tax-free and penalty-free. In general, in order to rollover qualified retirement plans to a Traditional IRA there must be a plan-triggering event. A plan-triggering event is typically based on the plan documents, but they generally include the following: (i) the termination of the plan, (ii) the plan participant reaching the age of 591/2, or (iii) the plan participating leaving the employer. A direct rollover transpires when a plan participant, who has access to his or her retirement funds, moves the eligible qualified retirement plan funds to an IRA custodian. In other words, a direct rollover is between a qualified retirement plan and an IRA, whereas, a transfer is between IRA financial institutions. In general, employer 401(k) plan providers must offer the direct rollover option if it is reasonable anticipated that the total amount of eligible rollover distributions to a recipient for the year would be more than $200. Your assigned retirement tax professional will work with you to establish a new Self-Directed IRA account at a new FDIC and IRS approved IRA custodian. With a direct rollover from a defined contribution plan, the plan participant must initiate the direct rollover request. What this means is that the plan participant must request the movement of 401(k) plan funds to the new IRA custodian, not the IRA custodian, like with an IRA transfer. Your assigned retirement tax professional will assist you in completing the direct rollover request form which will allow you to move your 401(k), 403(a), 403(b), 457(b), or defined benefit plan assets to your new IRA account. A direct rollover may be accomplished by any reasonable means of direct payment to an IRA. Regulations state that the reasonable means may include, wire, mailing check to new IRA custodian, or mailing check made out to new IRA custodian to plan participant. When an individual directly rolls over a qualified retirement plan distribution to a Traditional IRA, the employer is generally required to report the distribution on an IRS Form 1099-R, using Code G in Box 7, Direct rollover and rollover contribution. The receiving IRA administrator would them be required to report the amount as a rollover distribution in Box 2 of IRS Form 5498. Click the image below to view the Rollover Chart. An indirect rollover occurs when the IRA assets or qualified retirement plan assets are moved first to the IRA holder or plan participant before they are ultimately sent to an IRA custodian. An individual generally has sixty (60) days from receipt of the eligible rollover distribution to roll the funds into an IRA. The 60-day period starts the day after the individual receives the distribution. Usually, no exceptions apply to the 60-day time period. However, in cases where the 60-day period expires on a Saturday, Sunday, or legal holiday, the individual may execute the rollover on the following business day. An individual receiving an eligible rollover distribution may rollover the entire amount received or any portion of the amount received. 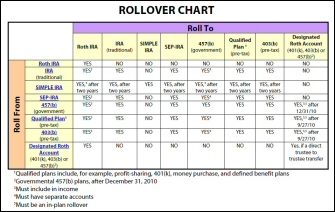 The amount of the eligible rollover distribution that is not rolled over to an IRA is generally included in the individual’s gross income and could be subject to a 10% early distribution penalty if the individual is under the age of 591/2. The retirement tax professionals at the IRA Financial Group will assist you in rolling over your 60-day eligible rollover distribution to a new FDIC and IRS approved IRA custodian. Once the 60-day eligible rollover distribution has been deposited with the new IRA custodian within the 60-day period, the new custodian will be able to invest the IRA assets into the new IRA LLC “checkbook control” structure. Once the funds have been transferred to the new IRA LLC, you, as manager of the IRA LLC, you would have “checkbook control” over your retirement funds so you can make traditional as well as non-traditional investments tax-free and penalty-free. In general, when a plan participant requests a distribution from an employer qualified retirement plan. IRS rules require the employer to withhold 20% from the amount of the eligible rollover distribution. If an individual receives an eligible rollover distribution and then elects to rollover the assets to an IRA custodian within 60 days, the individual can make up the 20% withheld by the employer retirement plan provider for federal income tax purposes. Employer sponsored retirement plans are required to withhold at a rate of 20% on all eligible rollover distributions of taxable funds or assets, unless the participants elects to directly rollover the distribution to an IRA or to another eligible retirement plan. In other words, when taking an indirect rollover from an employer qualified retirement plan, the employer is required to withhold 20% of the eligible rollover distribution. The 20% withholding requirements is not applicable for IRA-to-IRA transfers or for direct rollover distributions. When an individual takes a distribution from an employer sponsored retirement plan, such as 401(k) Plan, the employer should make the individual, even if the individual intends to roll the funds over to an IRA. The employer would be required to withhold 20% from the eligible rollover distribution since the funds will be rolled to the plan participant and not directly to the IRA or qualified retirement plan custodian. The employer (payer) would report the indirect distribution on IRS Form 1099-R, using the applicable distribution Code (1,4, or 7). If the funds are deposited with an IRA custodian within 60-days, the receiving IRA custodian would report the rollover assets on the IRS Form 5498 as a rollover contribution in Box 2. The retirement tax professionals at the IRA Financial Group will assist you in determining how best to fund your Self-Directed IRA or Self-Directed Roth IRA LLC structure. Whether it’s by IRA transfer or direct or indirect rollover, each client of the IRA Financial Group will work directly with an assigned retirement tax professional to make sure his or her Self-Directed IRA LLC structure is funded in the most tax efficient manner. To learn more about the Self-Directed IRA transfer or direct or indirect rollover rules, please contact a tax professional at 800-472-0646.